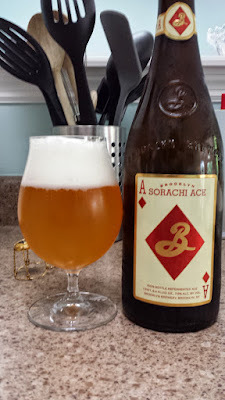 Brooklyn Brewery’s Sorachi Ace is a rather unique and special beer. Many brews are made with a combination of hop varieties this beer is very different as it uses 1 single hop from which it takes its name, the sorachi ace. While many hops are hundreds of years old, not so for the Sorachi Ace. It was custom engineered by Sapporo in Japan in the late 70s from a combination of Brewer’s Gold and Saaz hops, both classic varieties. Sorachi Ace hops also shows off one final unique characteristic by having a flavor of lemon and dill, different than the citrus/grapefruit/grass action of many hops. Props to Brooklyn Brewery for providing this mass of info on their website. It’s much appreciated! Pours an extremely cloudy, dingy orange gold topped with loads of thick creamy white head that is going nowhere anytime soon. That head helps hold down the bountiful aroma of lemon and grass. Not the greatest thing I’ve smelled off a beer but the aroma is impressively vibrant. More lemon flavor but not overpoweringly so; this beer is just lemon flavored not lemonade. There is more grassiness as well though I don’t get any of the dill mentioned earlier. Very crisp, dry, and highly carbonated mouth feel with a light and refreshing body. Saisons have been growing in popularity and this is a great offer to try and start with. I really enjoyed having this beer at around 4:30 on a nice hot Saturday it truly was very refreshing and enjoyable. The 7.6% is not detectable, in smell or taste, and I didn’t really “feel” it though I only had 1 glass of it and split the bottle with a friend. I’m not a huge fan of lemon flavor and never drink lemonade so that may have some impact on my not loving this aroma/taste. Don’t get me wrong though, I dig this beer and would drink it again just not all too often. However if you dig lemons then you should make trying this brew a priority. It should be available year-round wherever better beers are sold. Many thanks to Jess & Ryan for leaving this bottle at my house. I’d had it before but never given it a thorough review. Also, a great story here as Ryan was a Bud/Miller/Coors kind of guy until they went to New York City last month for a vacation and stopped (with some encouraging and jealousy from me) at the Brooklyn Brewery. Also, congrats to them on their engagement! Please proof read!! Had instead of head used to describe the beer. Also, then instead of than.